Kate McGarrigle died Monday. It felt like losing someone in the family. My first exposure to the McGarrigle Sisters came from an old lp, Dancer With Bruised Knees. I was smitten. The McGarrigle's never released a disk I didn't immediately buy. They seldom went on the road, but several years ago, the whole lot of them played at the Birchmere and I was on the front row. Kate and Anna were there along with Kate's children, Rufus and Martha and Anna's daughter, Lily Lanken. It was like sitting in big warm living room with friends, talented friends. They sang and joked and told stories; the evening was memorable. Kate McGarrigle -- New York Times Obituary. Cover Lay Down has a lovely tribute to Kate featuring the thing she loved best, her family singing. 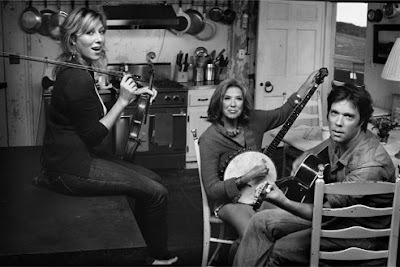 A sad passing...I saw Kate & Anna perform twice with Emmylou Harris. EH was a good fit as the third sister. DANCER WITH BRUISED KNEES is one of my all time favorites. Everything was especially lovely sung in French. Also, as a devotee of 1950's country music, I was saddened to hear of Carl Smith's death last weekend. He was June Carter's husband before Cash & quite a good country singer himself. Her music and love for it live on in both her children- have multiple cd's of both. How did I miss this... so sad. I watched a great documentary recently following the process that Rufus went through in creating his opera. There were some beautifully touching scenes shared by he and his mother. If you haven't watched it you should check it out. I"m sure you'd appreciate it. So sad.